Accurate Metal Finishing is a full service aluminum finishing company, with more than 50 years of experience providing Hard Anodizing, Clear and Color Anodizing, Teflon Coating, and Chromate Conversion finishes for aluminum parts. Anodizing is an electrochemical process that thickens and toughens the naturally occurring protective oxide. The resulting finish, depending on the process, is the second hardest substance known to man, second only to the diamond. 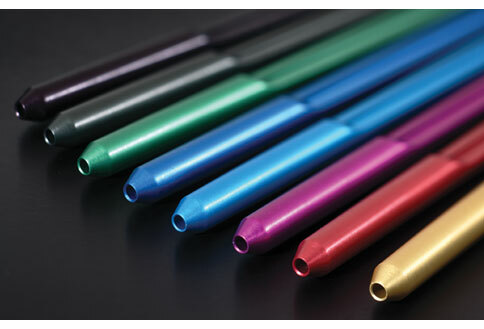 Anodizing is used for durability, color stability, ease of maintenance, aesthetics, cost, and health and safety. Since the anodizing process is a reinforcement of the naturally occurring oxide process, it is non-hazardous and produces no harmful or dangerous by-products. Accurate Metal Finishing offers Type II Aluminum Anodizing, as well as Type III Hard Anodizing in a variety of colors. Unless specified by our customer, Accurate Metal Finishing processes in accordance with MIL-A-8625. Accurate Metal Finishing also offers Chromate Conversion, processed in accordance with MIL-C-5541. Chromate provides increased corrosion resistance while remaining electrically conductive. Chromate provides a good bonding surface for paint and adhesives, and is relatively inexpensive. The oxide films produced by this process vary in color, depending on the aluminum alloy being treated, surface conditions, and the type of chromate. We offer clear and gold Chromate.